Oliver Wendell Douglas (Eddie Albert), a successful New York lawyer, and his elegant socialite wife Lisa (Eva Gabor) move to the little country town of Hooterville and buy a little farm that is not in good condition. Oliver intends to set himself up in a simple country life as a farmer, but neither the reality of country life nor the insanity of the locals allows it. Lisa hates the country, but is better at dealing with the locals: her idea of haggling with Mr. Haney, the door-to-door salesman, is to lower her price when he lowers his--and it works for her... Hooterville also has a resident genius: Arnold the pig. A spinoff of the very staid Petticoat Junction, the show was initially a by-the-books sitcom, in which Douglas was portrayed as an obsessive eccentric and Lisa, apart from being rather spoiled and having a poor grasp of English, was meant to be normal. Very quickly, though, the show took on a decidedly absurdist tone, Lisa turned into a Gracie Allen-style Cloudcuckoolander, and Oliver became the Only Sane Man. The insane townspeople still see Oliver as a nutcase, though, while rapidly embracing Lisa as one of their own. Oliver, clinging tenaciously to logic, sputters and despairs as he sees his dream life in Hooterville slipping increasingly out of his control. Eb (Tom Lester), the gold-bricking farmhand, who calls Lisa and Oliver "Mom" and "Dad", either as flattery or out of genuine confusion. To worsen matters, Lisa often forgets that Eb is not actually their son. * Mr. Haney (Pat Buttram), who sold them the faulty farm, and never gives up on trying to sell Oliver more dilapidated junk. Oliver thinks he's on to Haney, but he's surprisingly vulnerable to Haney's sales pitches. Mr. Kimball (Alvy Moore), the county Agricultural Agent in charge of keeping all the local farms in good stead, and victim to short-term memory loss to the point that he forgets what he's talking about in mid-sentence as a matter of course. Fred and Doris Ziffels (Hank Patterson and Barbara Pepper/Fran Ryan), friendly neighbors whose pig Arnold is very literally treated as if one of the family- specifically, their son. Eventually, Arnold becomes a fairly major character on the show. Everyone can communicate freely with him, except Oliver, who is at a loss as to why these people think they can talk to a pig. Alf and Ralph Monroe (Sid Melton and Mary Grace Canfield), brother and sister carpenter team who are contracted to fix Oliver's derelict farmhouse. Although the Monroes show up at intervals to supposedly do work, the house remains in a state of half-construction for the duration of the series. There's also Mr. Drucker (Frank Cady) down at the general store, who acknowledges the ridiculousness of Hooterville while at the same time whole-heartedly participating in it. He's the only character who even approaches being logical by Oliver's standards, often leading Oliver to start sentences with "Mr. Drucker, you're a reasonable man...". In keeping with the apparent rules of the series, Mr. Drucker's behavior on Petticoat Junction tends more toward the normal end of the spectrum. American Gothic Couple: In the opening credits. The Artifact: The theme song, which has Lisa wanting to go back to New York and hating farm living, even though that premise was mostly abandoned by the second season. Breaking the Fourth Wall: Occasionally done by Lisa to Oliver's bewilderment. Shares a universe with Petticoat Junction, which shares a universe with The Beverly Hillbillies. Yet one episode has the Hootervillian Playhouse use a BH TV script as a play, and makes jokes about creator Paul Henning and star Buddy Ebsen. Another episode casually mentioned that Beverly Hillbillies was one of the most popular shows in Hooterville. Lisa (and occasionally other townspeople) seeing and reacting to the opening "Written by" and "Directed by" credits. In one episode Eb starts humming the Green Acres theme song, and then mouths Eva Gabor's "Dahling, I love you, but give me Park Avenue." Very commonly the townspeople would ask Oliver how he got that fife to play "Yankee Doodle" in the background when he made one of his soapbox speeches. The City vs. the Country: Played with. Oliver is tired of city life and moves to Hooterville to live the idyllic (he thinks) life of a farmer. He finds, however, that Hooterville operates by its own peculiar set of rules, and is often frustrated by its colorful denizens. His socialite wife Lisa is always begging him to return to the city, but, ironically, she is the one who fits in, as she is as loopy as the Hootervillians. Cloudcuckooland: Although characters carried over from Petticoat Junction are mostly excluded from this. The jury's still out on Mr. Drucker. Con Artist: Mr. Haney is a prominent example. Cousin Oliver: Adorable little Lori lodges with the Douglases for a handful of episodes during the final season. Thankfully, she doesn't stick around long, and numerous episodes remain between her departure and the end of the series. Criminal Doppelganger: An episode featured a criminal who looked just like Oliver and the ensuing mix-up. Crossover: Characters from this show and Petticoat Junction occasionally gravitated to the other. And one 1968 episode of The Beverly Hillbillies had the Clampetts traveling to Hooterville, leading to characters from all three shows intermingling. Once to the point where Mr. Drysdale was physically ill at Elly Mae even being interested in Eb. Drive-In Theater: Oliver and Lisa attend one, only to be confronted by two Make-Out Kids in the car next to them. Easy Amnesia: Lisa gets hit on the head in one episode, believes Oliver is her butler, that she has a boyfriend named Mr. Fredericks, and demonstrates excellent cooking skills. Yet through the whole thing, she knows who Mr. Kimball is and treats him absolutely normally. Even the Subtitler Is Stumped: One infamous moment involving the subtitler trying to translate for Lisa's Hungarian, a Japanese chaufer's native tongue, and even a dog's barking... with Lisa actually correcting the mistakings, and even pointing out the audience isn't interested in what the dog has to say. Expository Theme Tune: Notice how it gets around Eva Gabor's lack of singing talent. How We Got Here: In one episode Oliver must explain why Arnold the Pig is in attendence at Oliver's allumni dinner. Interspecies Romance: Arnold the Pig and Cynthia Haney, a bassetthound (or as Lisa says, 'baskethound'). Kafka Komedy: A frequent plotline is Oliver doing something to improve life for the citizens of Hooterville, only to have it backfire on him spectacularly. Sometimes this occurs due to the incompetence of the Hootervillians, sometimes it's just because the laws of the universe demand it. Regardless, Oliver never learns to stop doing this. Green Acres has been compared to Kafka many times. Lethal Chef: whatever you do, don't try Mrs. Douglas' "hotscakes". In one episode, Oliver even used the batter to shape a replacement car part. They also make excellent replacement roof shingles. Limited Wardrobe: With the obvious exceptions of Oliver and Lisa, the rest of the cast wears the exact same outfits for all six seasons! Eb wears a green army cap and trousers, with a pale blue buttoned shirt, covered with a checkered coat with different shades of brown. Mr. Drucker wears a long-sleeved pale blue buttoned shirt, black sleeve covers, and a white apron. Mr. Haney wears a straw hat, a white buttoned-shirt with a brown vest and slacks. Mr. Ziffel wears an old brown hat, a red and green plaid shirt, and denim overalls, while Mrs. Ziffel usually wears the same spring green colored outfit (though on very rare occasions, is seen wearing something different). Mr. Kimball wears a khaki-colored hat, khaki slacks, and a tan coat. Alf and Ralph wear white hats and overalls, and blue work shirts. Although Oliver had many different vests, the citizens of Hooterville seem to believe they have figured out what each vest indicates he is doing, et al, "Oh, he's wearin' his plowin' vest". 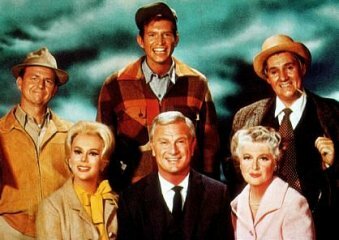 Even in the 1990 TV reunion movie, Return to Green Acres, the characters STILL wore their same outfits from the series (save for Fred and Doris Ziffel, since they were deceased). Medium Awareness: Lisa notices the drum-and-fife music that plays whenever Oliver makes an impromptu speech (as does pretty much everyone else), and even the opening credits at one point. Oliver: A week later than what? Lisa: Well, when Mrs. Ziffel came over here to do her washing! Oliver: I know it's a week later. You don't have to march in here and announce that. Lisa: Well, that's how they always do it in the movies. It's either somebody comes in carrying a sign which says, "Here it is a week later," or a calendar falls apart for a week, or somebody comes out and says, 'That week sure went by fast.' ... They do another thing in the movies, where the screen kind of swims" -- (which it proceeds to do when Oliver looks at her) "And that shows that you're dreaming -- but in this kind of situation we only do the one week later thing." Narrator: What's My Line? host John Daily in the pilot. Only Sane Man: Oliver, though all the other characters think they're sane and that he's the crazy one. And by Hooterville logic, they may be right. Mr. Drucker, however, could arguably be the only other sane person in Hooterville, for the most part. Only Shop in Town: Drucker's Grocery Store is this to Petticoat Junction, not just in this show but in Petticoat Junction too. Poorly-Disguised Pilot: The final episode began with Oliver contacting his former secretary (who was just as ditzy and absent-minded as Lisa) in New York for contact information for his old jeweler to get his watch repaired... the rest of the episode focused on the secretary as well as her family and friends. Running Gag: The telephone pole telephone, the closet door falling, characters seeing the "Written by" and "Directed by" credits, Arnold doing un-piglike things, Haney turning up almost instantly upon Oliver expressing a need for something, Lisa's 'hotscakes' and general non existent housekeeping skills. Screwed by the Network: Another victim of the 1971 Rural Purge. Strange Minds Think Alike: Usually kicks off with one of Lisa's non-sequiturs or "creative" language. Take a Number: Oliver draws a high number, while the by-the-book clerk is still in the single digits, and insists on systematically calling every intervening number, even though Oliver is the only customer in the room. Take That: Played for Laughs: When the farm is set up for electricity for the first time, Oliver goes to plug in his generator, causing a comical explosion that a narrator explains is what was really responsible for the 1965 northeast blackout. Through a Face Full of Fur: In one episode Arnold the pig blushes, with the help of special lighting. Write Who You Know: Pat Buttram based his performance of Mr. Haney on Colonel Tom Parker, Elvis Presley's manager, who he had met several years before when Parker worked as a carnival barker. This page was last edited on 7 August 2014, at 22:34.